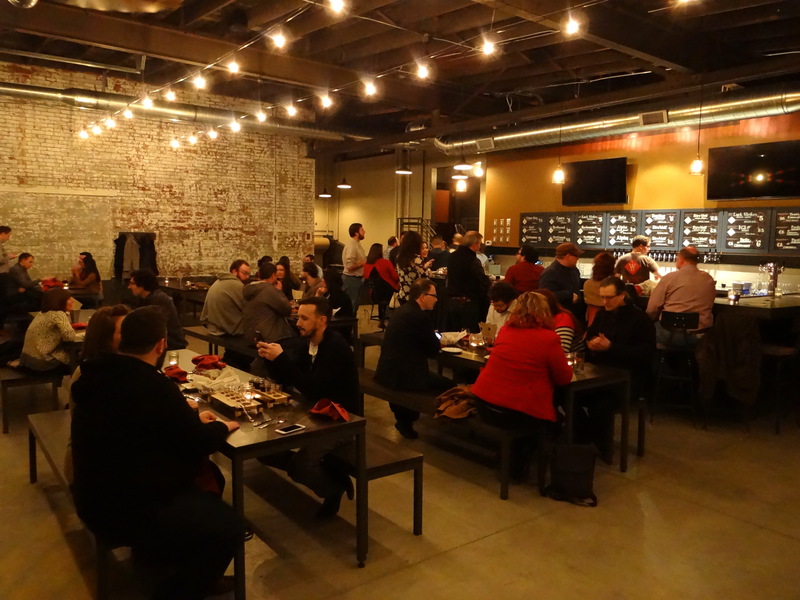 Fourteen months after initially breaking ground the taproom at Wolf’s Ridge, a topic of several posts on this blog, finally opened to the public last night. I was fortunate enough to be invited to a sneak peek of the taproom on Thursday night. So Mark Richards, who does most of the photography for the brewery visits, and I headed downtown to see if the taproom could meet our expectations. Here are my first impressions. The taproom takes up the northwest corner of the building that Wolf’s Ridge occupies (215 N. 4th Street). It’s a large space with a bar that seats a dozen or so people and enough tables to accommodate a pretty large crowd. For the preview party there must have been about 50 people there and it could have comfortably held twice that number. There are design features that highlight the craftsmanship you find in the restaurant, most notably the hand painted sign boards behind the bar that announce the beers on tap. At the same time the whitewashed brick walls, exposed ceiling, and cement floor keep things grounded and remind you that first and foremost this a place for drinking beer. When I visited Wolf’s Ridge back in November for a story on the beers of Wolf’s Ridge I was told that there would be 20 beers pouring when the taproom opened, and head brewer Chris Davison kept his word. There is something on offer to please every palate, including the easy drinking Clear Sky cream ale and the relatively new Gold Standard lager for those that prefer not to stray too far from the traditional lagers, IPAs for the hopheads that span the gamut from session to imperial, fruity Belgian-style abbey ales for the lupulin averse, and the newly released Dire Wolf Imperial Stout that was advertised as the mysterious Taproom X beer last week. To celebrate the taproom opening Chris has concocted nine different versions of Dire Wolf each infused with a different flavor. For opening night four versions of Dire Wolf were pouring in addition to the base beer. The Dire Wolf variants were infused with chocolate, One Line coffee, coconut, and chili peppers, respectively. Mark and I were hanging out with a group of writers and bloggers who know a thing or two about beer (Cheryl Harrison, Nicholas Decker, Dan Eaton, and Jim Ellison) and just about everyone at the table was effusive with their praise of Dire Wolf made with One Line Coffee. I was also impressed by the coconut and chili pepper versions. 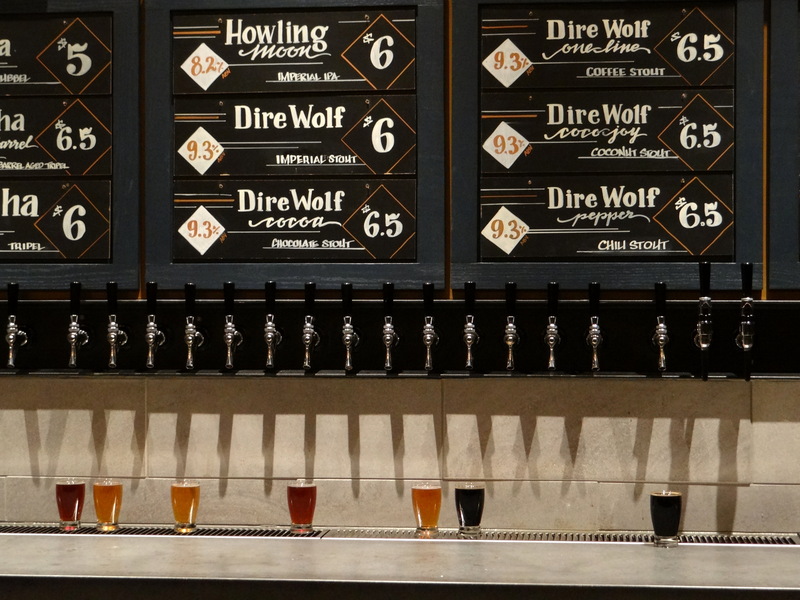 I strongly recommend you get down to the taproom and order a Dire Wolf flight for yourself. A word of warning though, Dire Wolf goes down so smooth that it’s easy to forget that it packs a 9.3% abv punch. My head reminded me of this fact on Friday morning. I was also really impressed with a beer that resides on the other end of the spectrum. Chris took their Driftwood Session IPA and infused it with grapefruit to make Driftwood Citrus Surf. The grapefruit blends beautifully with the citrus and floral hop character in a package that is only 4.5% abv. It is reminiscent of Fathead’s Sunshine Daydream, which is one of my favorite session IPAs. I hope this beer becomes a regular, it’s one of the best beers to come out of Wolf’s Ridge. Other beers of note include Buchenrauch Smoked Lager, which made my list of the top Central Ohio beers of 2014, and a version of their Alpha Tripel aged in barrels previously used to make Watershed Bourbon Barrel Gin. The combination of the juniper notes from the gin and the fruity esters of the tripel made for a beer that was intriguing but not to everyone’s taste (I liked it though). The Sustinator Doppelbock was yet another beer that I had not seen before. Both the N2 the Night Milk Stout and Luck Strikes Twice IPA were pouring from nitro taps for those of you who like a creamy glass of beer (and who doesn’t). To set the record straight the full restaurant menu is not available in the taproom. 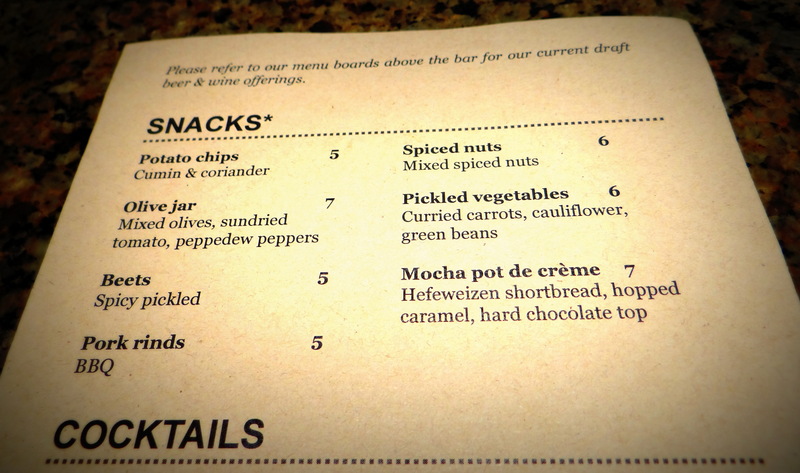 They do however, have a limited snack menu, which is shown above. We tried the pork rinds and the olive jar, both of which were quite tasty as you would expect for Wolf’s Ridge. It was my first encounter with pork rinds that didn’t come out of a bag. Personally I would like to see a few more options that would be effective in soaking up some alcohol, but it seems like they are limited to serving items that have been prepared ahead of time. 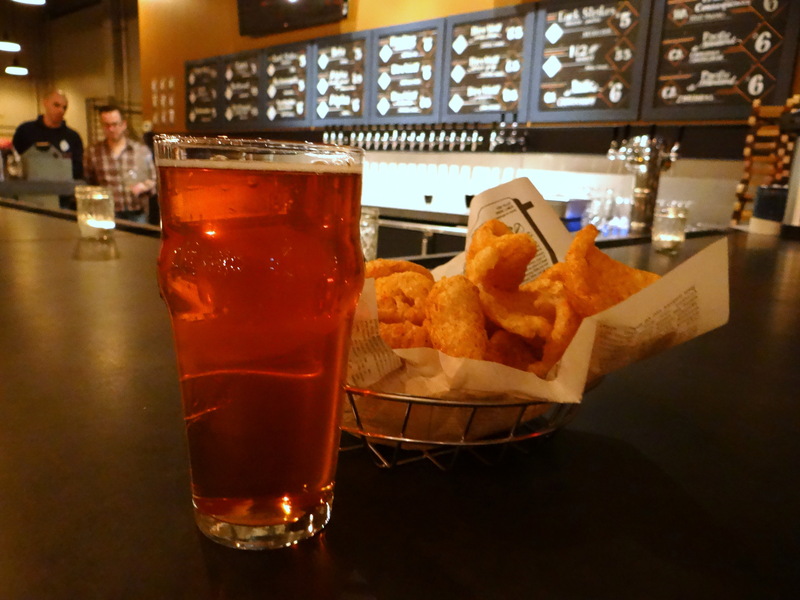 A pint of Driftwood Citrus Surf and an order of pork rinds.